Finally, back from Thanksgiving with the family and all the Holiday travel, and I hope your Thanksgiving was a great one. As I promised previously, I will be covering all the gear that BeeGee carries or has me carry for her. The list varies by season, but the majority of the gear will be the same. Plus, I convinced her to model some of her gear for you. The REI Ultra Dog Pack is BeeGee’s go to pack when I make her carry her own gear. Almost everything fits in it except the blanket and bed pad. The two saddlebags are water resistant and tough, I know because BeeGee would occasionally take detours into swamps or thick underbrush on our adventures in North Carolina. Another nice feature of the saddlebags is compressibility; the bags can be zipped up to decrease size and a drawstring to really get it tight. Unfortunately, this pack is no longer available, but Ruffwear or OllyDog have similar dog packs. The REI Dog Food Bowl is BeeGee’s hiking bowl. The bowl is lightweight considering its size and compressible. It’s a large bowl that has drawstrings to pull the top completely closed to avoid spills. I pack up each meal in a small zip lock bag (we bring them home and reuse them) and the bowl can store about 5 days’ worth of food. Again, REI is no longer making this bowl, but there are plenty of collapsible nylon bowls out there. As I covered in How to Carry Water for Your Dog, BeeGee’s water bowl is a collapsible silicone bowl that we picked up pretty cheap at Walmart. It’s lightweight, durable, and collapses very small, so it fits nice in her pack. We aren't a huge fan of how deep the bowl is (it’s hard to get that last drink of water), but it works for now. Also, covered in the carrying water for you dog article is the Platypus SoftBottle. The SoftBottles are soft, flexible plastic bottles with a screw on lid. I think soft bottles are similar to Capri Sun drinks. The bottles are split up and 1 bottle goes in each saddlebag, which helps divide the weight evenly. After a few trips, I quickly released BeeGee needed a brush to get dirt, leaves, and other objects out of her fur that we don’t want coming into the tent. Plus, a brush has the added benefit of calming BeeGee down. If she is still amped before bed or something wakes her up, I will brush her for a bit and she gets sleepy. The KONG Zoom Groom Brush is what we ended up with. Originally, I looked for a small finger brush, but couldn't find one. The KONG brush was the next best option. It is light and flexible. Moreover, it doubles as a shampoo scrubber. So, when we get home, I can scrub her down during a bath to ensure she super clean. If there’s anything I’ve learned about BeeGee is that she gets hot quick and loves to lie down in water to help cool her off. Shortly afterwards, I discovered Lightload Towels as a lightweight solution to wet dog in the tent. Lightload Towels are highly compressed, a little larger than a quarter, and extremely lightweight. Our towel expands to 12x24 inches; however, the towels require a small amount of water to expand, but this isn’t an issue because I just use BeeGee’s wet fur for moisture. If the weather on our trip involves rain, snow, cold, high winds, or any type of moisture, BeeGee gets to wear her Ruffwear Cloud Chaser Jacket. The Cloud Chaser is a water/wind resistant soft shell dog jacket. We have been out in some hard rain and this jacket has kept BeeGee dry where it covers her fur. Plus, it has enough room so she can wear her sweater under the jacket in really cold weather. Moreover, it has a side zipper so you don’t have to slide it over her head, which she is not a fan of. BeeGee wearing her Cloud Chaser Jacket. She was a little disappointed she had to wear it and not get to camp. In dry, cold weather, BeeGee will wear her knit sweater. This is just a cheap sweater I found at Target on sale last winter. It does a great job of keeping her warm in the right situation. While the sweater is mostly acrylic and should be water resistant; I wouldn't trust it to keep BeeGee warm in wet weather. 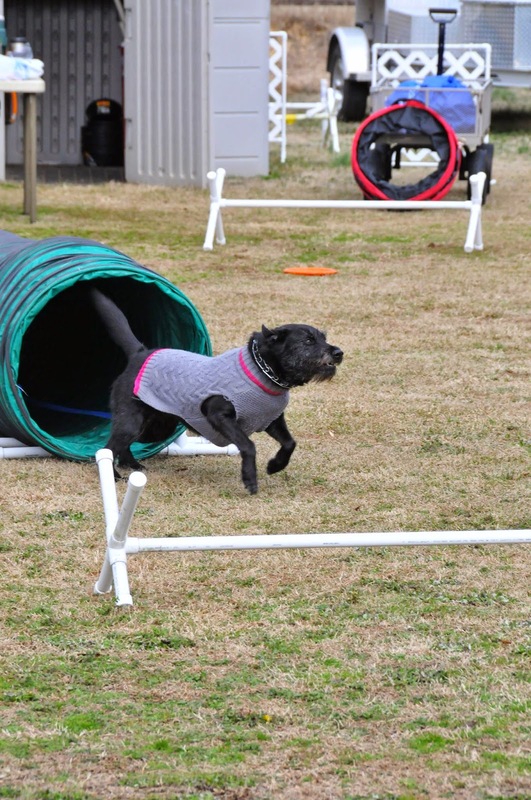 BeeGee running in her knit sweater. It kept her plenty warm in 30 degree weather. This is one of the items I end up carrying for BeeGee because it’s too big to fit in her pack. Her fleece blanket is a 50x60 inch fleece throw I found on sale for less than $2. If the weather is cold, I will cover her up with the blanket when we go to sleep to help keep her warm through the night. If the weather is warm, I cover her sleep pad to add a little comfort. I don’t enjoy sleeping on the cold ground or sharp rocks and I figure BeeGee doesn’t either, so I carry an inexpensive closed cell foam sleep pad. These are the inexpensive sleep pads you find in the Walmart camping section. I carry this item for her as well and I could cut the pad down to her size to make my load lighter, but it gives me the option to double up the pad on really cold nights or extremely rough ground. For hiking and backpacking, BeeGee just eats the same food she normally would at home. I feed her twice a day, and separate each meal in a zip lock bag to make meal time easier. The only difference is I increase each meal from 1 cup to around 1.5 cups. Just like I get hungry throughout the day on hikes, I assume BeeGee does too. So, I bring a long a zip lock bag of dog treats, which are usually something similar to milk bones. Every time we stop to take a break and snack, I get out 1 to 2 treats and BeeGee will snack with me. Recently, I have seen dog energy bars and I’ve considered trying those in the future. What gear is in your dog’s packing list? If you like the blog, go ahead and follow us on Facebook. Great to see BeeGee make an appearance!!!! She likes the attention for sure, but she would rather make her appearances in trip reports.